Michael Druks: Miss Out, (photograph, 1974). SCREEN PRACTICE brings together screen-related works by five artists, encompassing experimental film and video, filmed performances, photographs of interventions with a TV screen, sculpture/installation incorporating video, and pictographic notations of films and television programmes. With analogue broadcasting having ended in the UK earlier this year, this exhibition includes samples from the now historic pre-digital era of the 1960s and 1970s, together with other more recent thematically associated works. British artist, TINA KEANE makes works and installations using film, video and digital technologies. Keane is an influential practitioner of mixed media work, one of the founding figures in the women’s art movement, and developed her ideas relating to digital art and the internet when she was a research fellow at Central Saint Martins College of Art in London. Caution – Thin Ice (1993) was first shown in the UK at the London Institute Gallery in 1994. This video/installation/sculpture incorporates a poem-inscribed circular glass mounted on a tripod with a TV playing a video of a close-up of an ice skater’s feet revolving, combining images in movement with a sculptural setting. Keane’s film She records a multimedia performance at the Hayward Gallery, London in 1978, which used slide projections and live video recording onto monitors, one of the first performances to use video technology in this way. Keane used the area in front of the projected images to perform while a video camera recorded her image on to a monitor, bringing into play ‘the actual and the recorded, the illusion and the reality’. Abstract compositions with time-related components are represented by LUTZ BECKER’s Horizon from 1966-67. Berlin-born and London-based, Becker is an artist who is also renowned as a curator and filmmaker. In 1966, Becker met the electronics engineer Ben Palmer at the BBC Television Centre, and hoped ‘we might find some kind of visual equivalent to electronic music’. Together they explored ways in which visual effects could be created through utilizing a feedback loop between TV cameras and monitors. Made in the age of black and white TV, the film had colour added later, and was transmitted by the BBC in 1968. Horizon has been shown at Tate in the 2003 season A Century of Artists’ Film in Britain, and was also included in Jasia Reichardt’s pioneering exhibition Cybernetic Serendipity at the ICA London in 1968. 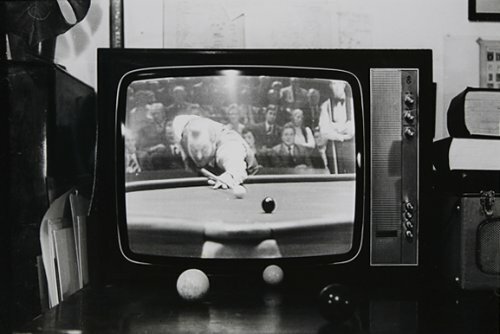 In Playbox from 1975, Israeli-born, London-based artist MICHAEL DRUKS appears in a performance area furnished as a living room, with a television set on a table, surrounded by household articles. Druks is shown reacting to, and interacting with, the programme being broadcast at that moment: he appears to give people seen on the TV a drink, or to put a pair of spectacles on one; he sits on the TV set, places plants or fabric in front of the TV image, and draws on the screen, eventually painting it black. Druks said at the time that ‘TV is an authority, a one-way traffic of ‘truths’ that have to be passively consumed without a chance of reacting, of giving feedback, of making a stand that could produce an effect. Viewers can never be too aware of this.’ In the related major photographic installation, Unauthorized Biography, more than fifty photographs show Druks’ varied interventions with TV screen images, with subversive, humorous and politically charged results. DAVID HALL is a British video art pioneer, TV interventionist, installation artist, sculptor and filmmaker. In A Directory of British Film & Video Artists, Michael O’Prey writes that ‘David Hall’s contribution to British video art is unparalleled… A founding member of the video art movement here in the early 1970s, he was an influential activist on behalf of the infant art form..’. Hall’s This is a Television Receiver was first transmitted in 1976 after being commissioned by BBC TV as the unannounced opening work for their Arena video art programme. Richard Baker, a well known newsreader of the period, is seen describing ‘the essential paradoxes of the real and imagined functions of the TV set on which he appears. The second shot is taken optically off a monitor, the third copied from the second, and so on, until there is a complete degeneration of both sound and image, removing the newsreader from his position of authority…’ (Tamara Krikorian, Art Monthly). Mark Wilcox wrote in the catalogue for the Arts Council programme Deconstruct, Subverting Television in 1984, that ‘this figure of authority is reduced to what, in essence, he is – a series of pulsating patterns of light on the surface of a glass screen…’. HARALD SMYKLA was born in Germany and has been London-based since 1988. His Movie Protocols are pictographic shorthand notations of films, created in real time as he watches them. Sequences of swift line drawings chase one another like words written on a page, while he attempts to make some graphic record of every single take. This attempt to capture film through live drawing generates its own visual language: hectic cuts and on-screen movement result in rapid, near-indefinable graphic ciphers, whereas when the camera lingers, Smykla can generate some pictorial detail, even recognizable portraits of actors. The process of making a story-board is reversed, not through analytical intervention but through a reactive dialogue with the film itself. When Smykla uses overhead projection, it enables him to make a Movie Protocol a public performance, which creates a simultaneous parallel screening of a very immediate personal and physical interpretation of the film.